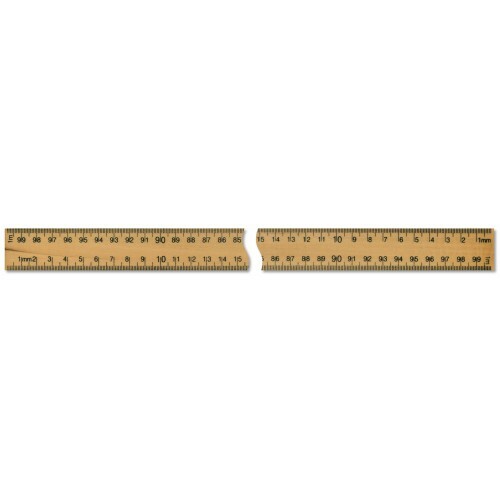 If you are looking for a versatile ruler that can help you with all those larger-scale measuring and drawing tasks you need to complete, whether it's for school, college, work or a project at home - there is one place you should go. That's right, you should come here to The Ruler Company, where we sell only the highest quality products made from the best materials. Take this one-metre wooden ruler for instance. It's made of durable hardwood, so it is less likely to break or snap compared to those cheap and tacky plastic rulers you get everywhere. What's more, it has markings for both mm and cm from 0 to 100 and 0 to 1000 on both edges, rather than the usual of just one edge. This means that from whatever angle you use it, you will always know exactly what the length of something is that you are measuring. Ideal for when you are working with larger lengths and sizes. At The Ruler Company, we are incredibly proud of our commitment to only producing and supplying top quality, reliable rulers and other measuring accessories such as measuring tape. We feel that as our customers, you deserve the best quality we can offer, and that is what we try to do each and every time we release a new product. This one-metre stick ruler is no different. We chose hardwood for its positive qualities, and most of our products are made from hardwood too unless otherwise stated.